This morning I took my teenage nephew Daniel for a ride in the snowy woods near our tiny village in the Russian countryside. We breathed in the crisp December air and tuned in to hoof beats on crunching snow accompanied by the drumming of a red-spotted woodpecker on a nearby Scot’s pine. 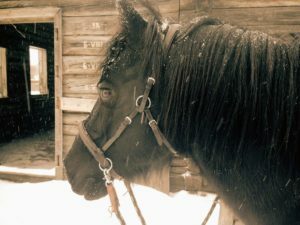 My 23-year old black gelding Orlik expertly picked his way down the forest track, skirting ice-clad puddles. Daniel trailed behind me on the graceful but leggy bay trotter, Posadka, an ex-broodmare adopted from a racetrack breeder who no longer had a use for the old mare. As I admired the woodsy view between Orlik’s fuzzy black ears – perked forward in wary curiosity, I took in a few deep breaths and called out in Russian for my nephew to do the same. Then I asked him to lay the reins on the horse’s neck, to trust the old mare, and do as I did. I lifted my arms out to the sides – a bird gliding through the tall pines, and then twisted from side to side, all the while peeking back to glimpse Daniel following my lead. The horses kept on, without wavering, by now used to the crazy antics of humans on board: beginning riders gaining their seat and building trust; clients in my equine-facilitated coaching business enjoying mounted yoga; and kids with disabilities overcoming developmental delays. Daniel swung his arms from side to side, wearing a broad smile across his face. Daniel has a severe stutter, which miraculously lessens when he is with my horses and, as we discovered, completely disappears when he rides. Riding is something special he loves when he comes to visit, traveling two hours from the city of Bryansk. Today it was even more special: today was Daniel’s 15th birthday. I enjoy riding too. But as much as I love taking Orlik to the woods or helping Daniel to speak, I can’t help but to think whether or not I should be riding my horses at all. I often question whether Orlik likes my riding him, too. Of the eight horses in our herd, only five are what I would call “ridable.” None of them are physically impaired per se, but three have given me clear indications that they prefer not to carry humans on their backs. As I have grown more attuned to my horses, listening carefully to their wants and needs, they have in turn become more confident and outspoken in telling me what and when they are willing and not willing to do. Riding horses is not something I ever questioned before I became an equine-facilitated learning practitioner, just two years ago. 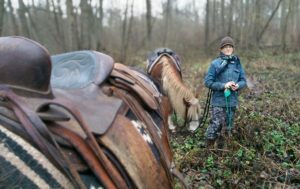 For me, horses and riding had always gone hand in hand, since I was a girl growing up in Colorado, performing in gymkhanas and reining, and even when I became a wildlife conservation activist, moving to Russia to set up the first office of the World Wildlife Fund 20 years ago. It was through that work that I met my Russian husband, Igor – a naturalist and wildlife photographer – and later followed him to the Bryansk Forest, 350 miles southwest of Moscow, where I began to gather a herd of my own. Igor had always kept horses. For him, horses were the most reliable form of transportation through the impassable woods and wetlands of the nature reserve where he worked. He would use them to patrol for poachers or seek out nests of rare black storks deep among the peat bogs. Horses in Russian villages have traditionally been, and still are, vital for transportation, as well as needed to plow fields, haul wood, and cut hay. Yet often I wonder: what is in it for the horse? Do horses value or need these things or need to be doing something? Things get even more complicated when I peruse scientific articles and online opinions stating that horses were never meant to be ridden, that their backs aren’t designed for it. Ever since, an inner conflict about riding constantly rages in my mind. When the affable young Pecheron, Daisy, will come pick me up off the fence or a log of her own accord and free will – is this enough to justify me riding her? Does that mean she enjoys it? Or has she just seen other horses in the herd being ridden and assumed that is what a horse does? Since she is only 2.5 years old, and despite being larger than all the other horses and weighing more than 650 kilos, I am still conscious of my weight on her young body and never sit on her for more than a few precious minutes, all the while grateful, adoring her, feeling blessed. Nowadays, the Internet seems full of articles and blog posts by people who don’t ride or don’t use mounted work in their EFL practice, or even find it unethical or “unvegan” to ride. I truly see the benefit in unmounted work for EFL: when the horse has the ability and the choice to respond naturally and uninhibited, providing genuine and raw feedback to the client. But outside of my EFL practice, I do ride my horses. Even so, I try to do everything “right” and in a conscientious manner. I often work at liberty, teaching them to carry me using praise-based methods. I reward their efforts through lots of scratching and kind words, as well as honor their “no” – when they are not ready or willing to learn. I strive for good balance and to help them gain proper posture. I make sure I don’t put too much weight proportionally on my horses, and I listen to them and watch for signs of discomfort. I read up on the research and how to ensure best saddle fit and all the rest. And I wonder: how much do the research studies out there about the harm of carrying a rider apply to cases like mine where horses are ridden for maybe a few minutes or hours a week on average? Are most studies looking at horses that are ridden constantly, or carrying more than 10-15% of their body weight over long distances? Or do the horses carry unbalanced riders or have bad posture or high stress levels with head raised high and back out of line? And how much of it depends on the horse? If the horse has naturally good posture and a calm disposition and an empathetic rider, does this influence how much damage is caused long term? I ask myself these questions, not because I try to justify my own philosophy about riding, but because I do worry about my horses’ health and happiness. Humans, too, were not meant to carry weight on their backs or shoulders, yet we might happily carry a child or a small friend a short way for a fun piggyback ride, without causing ourselves harm. But if we were to carry the same child for many miles each day, we might indeed do long term damage. Or would we build muscle tone to be able to support the weight? What about the fact that we load our children’s backpacks with books and lunches to carry to school? My son has even fallen over backwards from all the weight! Why is that not a topic of intense debate like horses carrying riders, I wonder? Given the choice, would horses rather stand around in a paddock all their lives (or worse – a stall) and occasionally be sent around a round pen or a mechanical trainer for badly needed exercise, or would they like to go out and explore the world with their humans on their backs, walking through the woods, or galloping among the deer? What form of exercise would they choose? Many people prefer to go to the gym and run on a treadmill rather than hike in the woods. Are horses different too, depending on their personalities, their upbringing, their surroundings, their humans, and how they are treated? I don’t know, and so I keep asking. I ask my horses, too. I go out to the herd in the pasture and casually inquire, just before jumping on tackless, “What do you think about me sitting on you for a few minutes as you graze?” If the horse walks away, the answer is clear. But if the horse lifts his head and waits patiently for me to clamber on (I am not as nimble as I used to be and it might take me several times to jump on! ), then I take this as a sign of consent. It’s our little pact of sorts: I vow to ask and to honor you, and you vow to let me know how you really feel. Sometimes, my horses don’t seem to have an opinion one way or the other. Prior to our ride this morning, I asked the graceful Posadka, “Are you okay with taking my nephew to the woods for a little birthday present, as long as you are with Orlik?” (I know she would be stressed on her own). I stood there, and I listened, and I breathed. But, even after a long pause, I got no answer. I don’t think she even understood the question. Maybe it would be like asking a person: What do you think about having a job or living in a house or wearing clothes? Right or wrong – culturally, philosophically, economically – it has been ingrained in our society that everything has to have a purpose to be of value. Maybe some horses just accept that riding is how humans and horses spend time together, or at least a primary way for most. 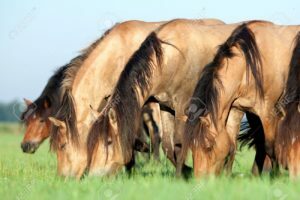 Not many people go out and stand among their herd and admire the way the horses graze or doze with eyes half-closed in the sun, as I often do. And it’s not just keeping horses that elicits justification of an animal’s purpose: in the Russian countryside, dogs are meant to keep intruders at bay, cats catch mice, hens lay eggs, cows provide milk, and so on. Even pets living in apartments in cities are meant to keep their owners company or relieve stress or give children a sense of responsibility. I suppose pet fish are off the hook, yes (sorry for the pun), though maybe they too are kept for some purpose. Aesthetics? Am I afraid of the wide-eyed stares? Or am I worried that people will think I have nothing “better” to do or have more money than I know what to do with? Such cultural beliefs are not east to shed. 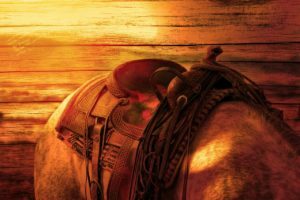 Why should a horse be asked to work for its keep? Should my farm horse Masha be asked to pull a wagon with hay or to plow a field to grow oats to feed her and the herd through the winter? If she was never asked that – and if none of her ancestors were asked that – would Masha even exist? Despite all my ponderings, I still don’t have the answer on whether or not I should ride my horses. What I have learned is how important it is to keep asking myself these questions. The more I question my beliefs and my motives, the more I am able to be true to my nature and that of my horses. And it isn’t about doubting myself or worrying what others might think, but rather about evolving in my own thinking and learning from my own experiences, as well as benefitting from the experiences of others. 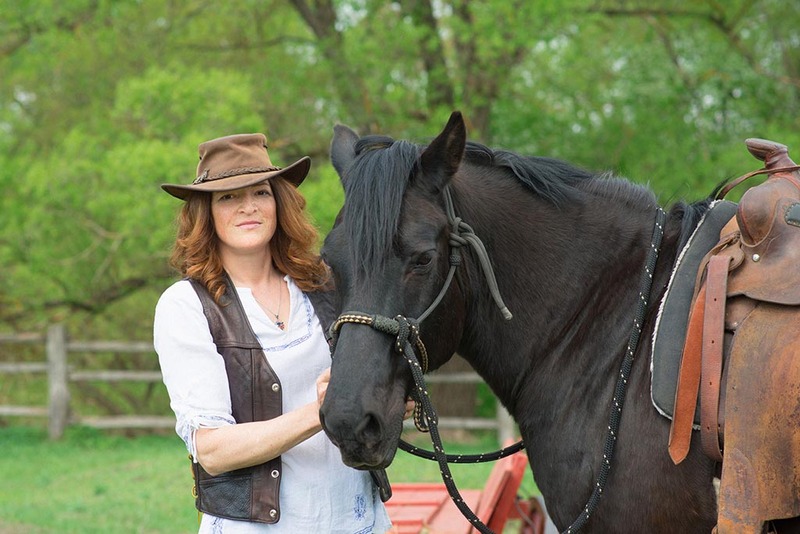 Discussing these topics with like-minded folks has helped me to grow and relate to my horses in a more profound and honorable way: honoring myself, honoring the horse, and honoring the relationship/space in-between. As EFL practitioners, we know that what works with horses can often transcend to all relationships. So by honoring my horses and questioning ingrained and utilitarian beliefs like horseback riding, I am learning to better honor my own kind and the wants and needs of other humans as well. He is exaggerating, of course. I do let him ride, and often we ride together: but not all the horses, and not all the time. 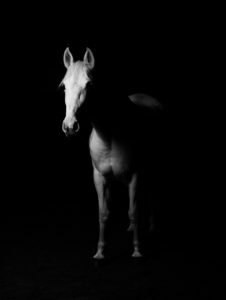 The Healing with Horse Collective wants to hear from you! People are talking about ways to serve and care for the horses who serve us; ways that are not “status quo.” Classical Dressage, natural horsemanship, and liberty training methods led to evolutions in how we perceive horse behavior, and that has led to innovations in our collaborations and care for our horses. For some, these really are new ways as horse people test the boundaries of what is possible with horses. For others, it’s about returning to old ways with new appreciation for the horse. Submit your story to the Lessons Learned Blog Series! Wonderful questions and thoughtful musings on to ride, or not to ride. Like you, I ask a lot of questions and am doing a lot of exploration around this topic. My latest question to my 11-yr-old mare Zorra was: “Do you just never want to be ridden again? Or is there a way to make riding enjoyable for you?” After asking this question off and on for a couple months, she flashed me a picture of my 7-yr-old niece who rode Zorra quite happily (for both of them) in the summer. At first I thought she was saying, ‘Only young kids’ but then I realized she was showing me that it was my weight that was the problem (I weigh 125 lbs). Her back/structure is not conditioned to carry my weight comfortably/easily. In fact, it causes her pain – despite 2 years of regular chiropractic, massage treatment, Reiki, etc. So her answer is that I need to start with small weights and gradually build up as she strengthens. I’ve put my intention out there for a child to come for long walks on her back, with me leading. And I’ve begun teaching her a cue to lift her belly/spine, so that I can remind her as we walk. But it’s winter and pretty miserable and no one wants to go out in the rain. So, we will all just hang out instead; cuddle, eat and meditate together. It’s all good! And if no child is forthcoming in the Spring, then I’ll try weighted sandbags and see what she thinks of that! Thank you for this beautiful post, Laura. Your question is something I have been pondering a lot too for several years. There is so much richness in what you wrote and what touches me the most is your dedication to inquiry and reflection. We humans, especially of the Western Mind, are so eager for concrete answers and so uncomfortable with ambiguity and not knowing. That the EFL community has raised the question (and likely others too), is fantastic – it’s a great question. As you so eloquently point out, it’s a question that begs to be held, deeply. I live with a herd of 6 horses and a donkey. All of them have been with me for 2 – 18 months except one … Echo has been with us for 10 years. Early on she was an incredible playmate for my young daughter (Echo was quite young too) and she and I enjoyed riding through the woods and trails. Then she became a competitive jumper. During that time she had great physical care, however, our eyes were not yet open to the potential that would come. Sometimes she would balk at jumping and we would withdraw for the day (more in truth, because it’s expensive to enter classes only to be disqualified). I suppose that was her exercising some form of choice. When she wanted to jump, she would literally strut and show off as a small (16 hand) powerhouse among much larger and well bred jumpers. She led me to EFL and 2 weeks before I started a year long certification program she unceremoniously dumped me off her back, twice because I was not getting the message! Since we moved to our farm with the other horses I have seen a wisdoms and growth in Echo that continues to astound me. Many of the other horses came here having recently endured much suffering and Echo gently and masterfully nurtured the herd energy to life. When my daughter visits, Echo eagerly awaits greeting her and willingly lets her on her back. She is still very clear with me that this is not how she wants us to relate. What I take from this experience with Echo is maybe there is no definitive answer to the question of should we ride. Maybe it’s more nuanced and particular to the horse, the person, the time and place? Thanks again for this great post and all the best for 2017. Thank you for sharing your experiences. It is amazing what horses can teach us if we let them. As an update, I have since stopped riding my black gelding Orlik. I was concerned that he didn’t want to trot with me anymore and was in pain, so I had an osteopath take a look and she confirmed that he has back issues and pain, so just on-the-ground loving for this boy from now on and lots of freedom of choice. I’m so happy we can speak frankly about these things! And not with shame and accusation, but with grounded and open-hearted curiosity. I’ve been through it all too. I am gifted with the occasional ride on one of my 4 horses – and if I ask on the wrong day I get a most emphatic no! I so appreciate the way you’ve laid it out here, without conclusion but with steady direction. Riding may very well be wonderful for certain horses at certain times with certain people. There may be no way we can answer this query definitively. I think what you and I and so many people are being called to is a willingness to reconsider, to stay in not-knowing, to look plainly at our own motives and consider the health of the bodies and souls of the brings we love. The wealth is not, then, in the riding or not-riding, but in the courage to wonder. This is a beautiful piece, thank you so much for sharing.